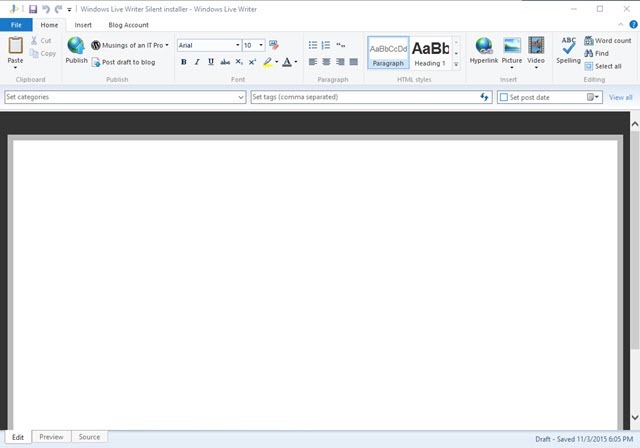 Live Writer is a great blog writing application from Microsoft and my personal favorite. This package will install just Live Writer silently. It will not prompt you if you would like to install any of the other Live programs. Run with administrator rights and give the application about 3-4 minutes to complete the install. I have an interesting dilemma with Windows Live Writer. Windows Live Writer makes the claim that it can be used in ‘offline’ mode without the need to connect to a blog site. Unfortunately Live Writer will not complete its own installation to your computer without you actually having a Blog site to connect to. Yes : I understand it needs to make a handshake with a blog site : but what if you just want to use it as a slightly more feature filled version of Wordpad : upon which it is based ? That’s my dilemma in a nutshell. I don’t really want to have to run a blog just to get Windows Live Writer to work ‘offline’. I wonder if (like PE) there is someway to create a perfectly legitimate version of WLW which is able to install itself completely without the need to check for a blog in order to work. It’s a pity that WordPad doesn’t have to same tools that WLW has already built into it : like a spellchecker and word count etc. Why not just create a wordpress.com or blogger.com site just so your can setup live writer? It’s free and is fast to setup the blog account. After that just save your files as a local draft.